One of the things you find when you move home a lot is that you come across weird stuff in your house from time to time. I have been lucky enough to live in a few different countries and each one has brought with it some bizarre surprises. The following are some of the unexpected and frankly unwanted house guests I have had over the years. I was inspired to write this when I saw an interesting video from British Gas recently. It is about a former apprentice who went to fix a broken down boiler. It probably seemed a normal enough job to her but when she got there she discovered about 300 birds in the house. I’ve no idea why you would keep so many birds in your home and I’ve never even seen so many flying creatures at one time. However, I do remember the night when I was a kid and a bat came crashing into our home through an open window while we were all sitting round the telly. We all freaked out, except my Dad. He just picked up the dazed critter and sent it on its merry way without even putting down his cup of tea. We also had a sparrow that apparently came down our chimney one morning too. As for the British Gas apprentice that was startled by hundreds of birds, she was called Sarah and you can read her story here. A spell living in Spain let me to get used to running about the house chasing giant cockroaches in the wee small hours. This wasn’t a particularly enjoyable hobby but I hated seeing those creepy little guys on my floor and felt I had to do something about it. It happened when I lived in a ground floor flat and I think the problem was probably that the giant communal rubbish bin was just outside my door. This is probably what attracted them and they simply didn’t want to leave once they got there, so they invited some friends round until there were loads of them scuttling about. They say that cockroaches are capable of surviving a nuclear war but I can confirm that a firm strike with a broom is more effective than nuclear warheads in this case. The only problem I had is that they are incredibly fast and could sneak into nooks and crannies where my broom couldn’t. I eventually got good at catching them but I was still pretty pleased to leave that flat behind. 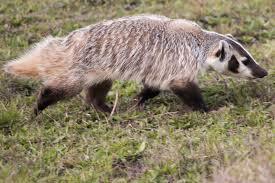 I then moved to Bolivia and to be honest I had no idea that they even had badgers here. At least I didn’t until one ended up on my balcony. I opened the door for a bit of air one morning and this wild-eyed, toothy creature started snarling at me. I tried to convince myself that he was probably as frightened as I was, but I failed. He seemed to be injured and spent a couple of days curled up there before sneaking off. I would look at him through the window and then look up internet photos to try and work out if he was a badger, a raccoon or some other sort of savage animal. I finally decided he was an American Badger but he might actually have been a cross between a badger and Spiderman, as I have no idea how he got up there in the first place. I tried telling my neighbours about how a badger the size of Ronnie Corbett was on my balcony but I had no idea what the word for badger was and they weren’t very familiar with the comedic joys of The Two Ronnies. What weird things have you found at home? What Is the Weirdest Thing You Would Do to Save Money on Food? To Rent or Buy A Home? The Argument for renting! Oh, I totally hate cockroaches! I hate to see them flying everywhere! Luckily the only thing I came across was a mouse and that was back in college. I’m hoping to never have that rodent in my house again. My parents had a bird in the house. It came down the chimney somehow and was flying around downstairs. Not sure how they caught it/got it out, but they did.